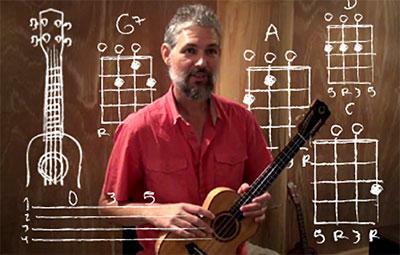 Ukulele Player Series, an entry-level course created by Khabu Doug Young, applies fundamental musical concepts to the ukulele in a fun, easy-to-follow program that will have you playing music right away. It's a self-paced course that includes videos, worksheets, and audio tracks for singing and strumming along. The Ukulele Player Series is organized in two parts. Part 1 explains the basics of picking and strumming, introducing basic melodic ideas and chord shapes by way of classic tunes. By the end of Part 1, the student will be able to play a number of simple songs, and will begin to put together melodies and chords. Part 2 further explores the relationship between keys, melodies, and chords, providing the student with the ability to play in both the major and minor modes across various key centers. By the end of Part 2, the student will have a basic command of crucial melodic and harmonic concepts, a repertoire of more than a dozen songs, and the requisite knowledge to begin improvising and composing on the ukulele. Students can supplement their learning by choosing one of the enrollment options that includes private lessons with Khabu. The private lessons bundled with the course are all 30 minutes in length. By the end of Part 1, the student will have a working knowledge of the instrument, a basic understanding of the relationship between melody and harmony, and the ability to play a number of popular tunes. If you're a more advanced player, you could also check out Khabu's Jazz Lab here. The self-paced course. The Ukulele Player Series is divided into two main parts. Complete beginners should start with Part 1. Those with some knowledge of the instrument and able to play basic chords can dive into Part 2. The complete Ukulele Player Series, Parts 1 & 2, will give a beginner or advanced beginner a really strong foundation of understanding so you can play your favorite tunes and jam along with friends. You will receive lifetime access to the Ukulele Player series course materials within one day of enrollment. Optional private lessons. ​If you would like to learn alongside a master teacher, you can also get guidance directly from Khabu in private lessons held over video conference, or in person, if you are in the NYC area. If you'd like to coordinate times and locations with Khabu before purchasing, you can send him a direct message from his booking page here. The private lessons included with the course options above are for 30 minute lessons and must be used within one year of purchase. If you would like to take longer lessons, you can book those separately from Khabu's booking page or by calling us. Khabu teaches ukulele, guitar, and improvisation for all instruments. He has held numerous workshops and clinics throughout Europe and North America, in schools such as Arizona State University (Phoenix), Bennington College (Vermont), California State University (Hayward), Denver University (Colorado), HSPVA (Houston, Texas), SUNY (New Paltz), University of Arkansas (Fayetteville), University of California (Santa Cruz), University of Northern Colorado (Greeley), Williams College (Massachusetts), Wichita State University (Kansas). View Khabu's complete teaching profile. If you have administrative questions, please contact us by emailing jess@lessonface.com or by calling 1-800-211-7058. If you have questions for Khabu, you can send him a message from his private lessons booking page, or at his website, khabu.net. Enroll to receive immediate, lifetime access to this course. We also offer an option above to get lifetime access to the two parts for $8.95. You may also learn more and save by bundling in three 30 minute private online lessons with Khabu, essentially getting the full course for free. If you try the Ukulele Player course and don't like it for any reason, let us know within 30 days of your purchase and we will refund your full tuition.